This article is 1989 days old. 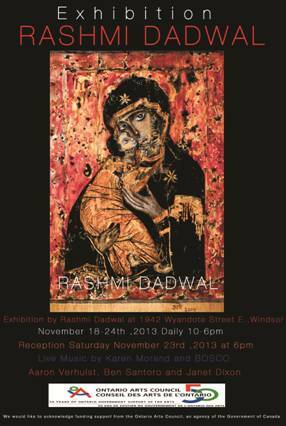 Rashmi Dadwal will be hosting her 10th annual exhibition, at the Artspeak Gallery, from November 18th to 24th. Rashmi is a mixed media artist, blending and shifting between creative mediums – textile design, fine arts, handicrafts, stained glass, and sculpture. Rashmi Dadwal is the recipient of the Mid-Career and Established Artist Grants awarded by the Ontario Arts Council 2013. She has shown her work at nine solo exhibitions in Windsor, Ontario and in many juried as well as open invitational group exhibitions. Rashmi’s unique art pieces and icons often combine organic and religious spirituality with environmental consciousness. As a result, Rashmi’s unique objects d’art have permeated Windsor and today serve as time stamps of over a decade of artistic evolution and progress. As an Artist Rashmi seeks to create multi-dimensional, mixed-media art that transcends boundaries, whether physical, spiritual, or intellectual and that can be enjoyed, appreciated, and afforded equally by all. Come out and support Rashmi – there is something for everyone! Artspeak Gallery is located at 1942 Wyandotte Street East.